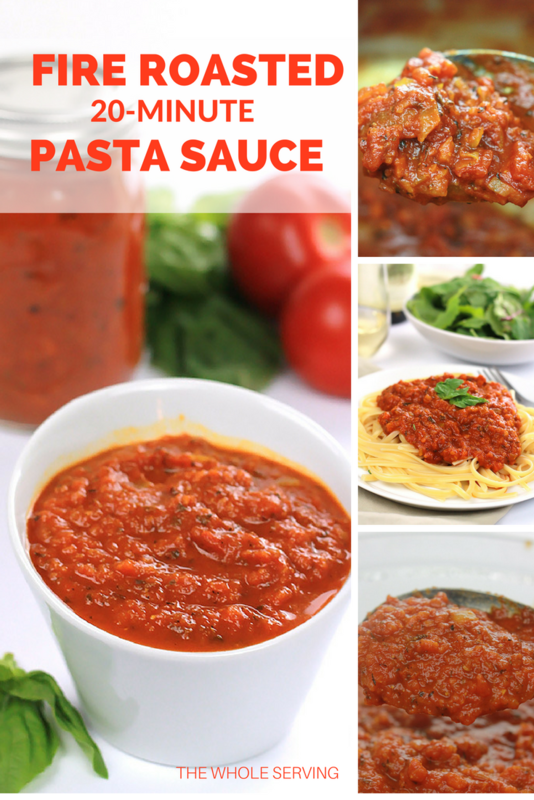 Thick, rich and full of flavor, this Fire Roasted 20-Minute Pasta Sauce will have you giving up your store purchased sauce. Serve it with your favorite pasta, or use it as a pizza sauce. 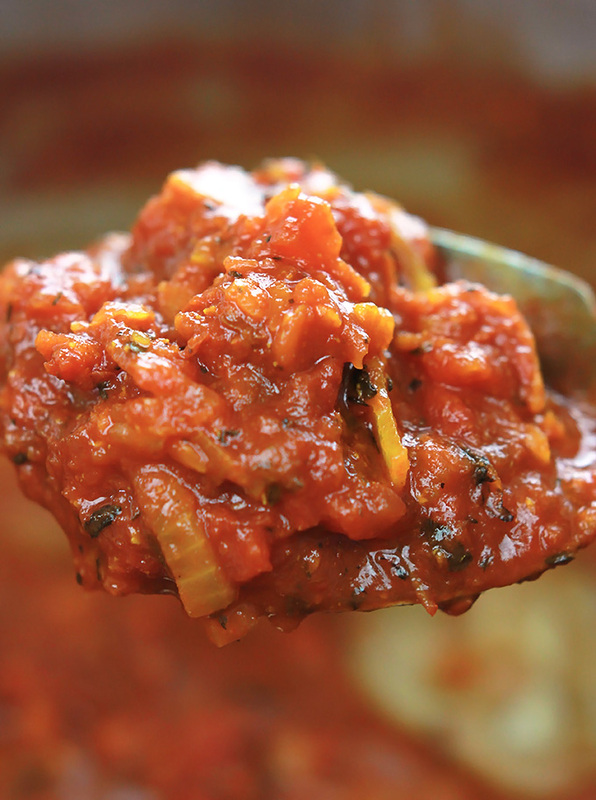 This is by far one of my favorite go-to pasta sauce because it takes only 20 minutes. When meal planning I make it and store in my fridge until ready to use for the week. But it’s so easy that you can make it while waiting on the water to boil and the pasta to cook. Growing up my Mom used pasta sauce from a jar, but she always had me chop extra veggies to add-in, which is why I like hearty sauces. Unlike my childhood days, I used a food processor to chop the carrots to get them into small pieces. The other veggies were chopped by hand and added to the pan with the carrots before adding the diced fire roasted tomatoes and sauce. 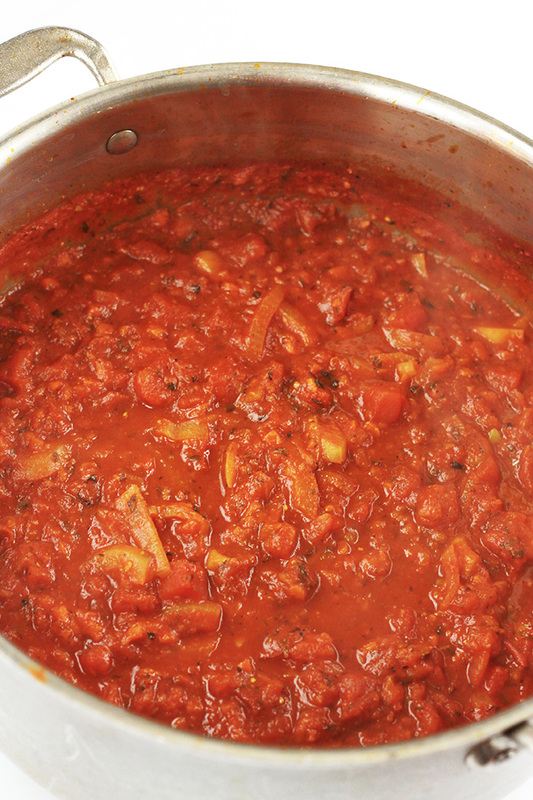 After 10 minutes of simmering you’ll have a chunky pasta sauce. You can serve the sauce thick and chunky or process in the food processor for just a few seconds and make a less chunky sauce. Just look at all of that chunky goodness! I processed the sauce to make a mouth-watering recipe that I will be sharing with you all next week. It’s a super delicious one you don’t want to miss. 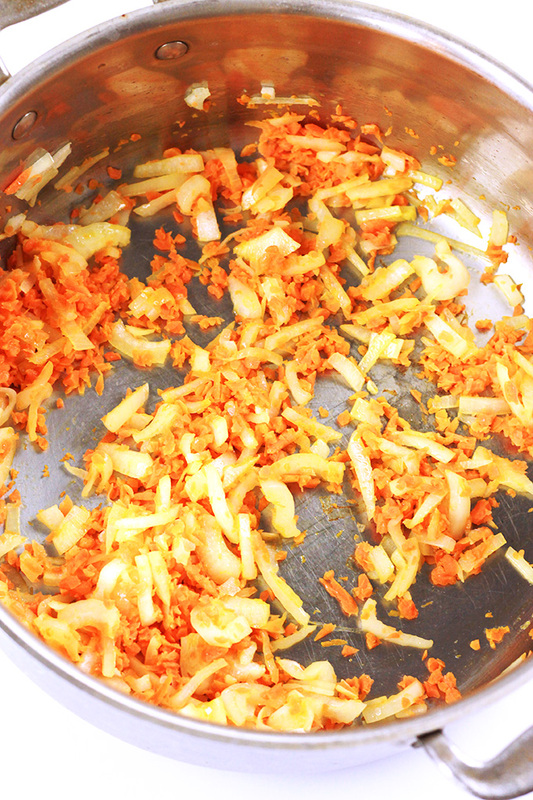 After cleaning the carrots, place them in a food processor and process until they are small pieces, note the photo above. If you don’t have a food processor, you can has a box grater or purchase pre­ shredded carrots and chop. Heat oil in a large pot over medium­high heat, add chopped carrots and onions to pan and sauté about 1 minute, the onions will start to soften. Add the peppers to the pan and sauté until they start to soften. Add the garlic and sauté until fragrant, about 1 minute. Add in the remaining ingredients, reduce heat to a simmer and allow to cook 10 minutes more, stirring occasionally. Taste and add salt to taste. 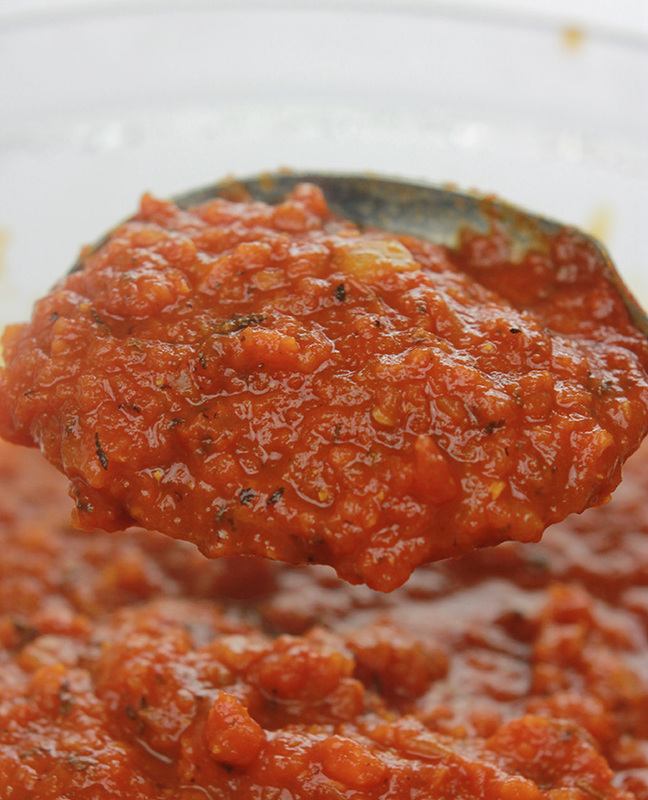 Allow sauce cool a bit before adding to blender or food processor if you choose to serve a less chunky sauce. Process sauce until desired consistency is reached. 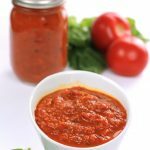 Transfer sauce to storage container and store in the fridge until ready to use or serve immediately with pasta if your choice. Sprinkle with red pepper flakes and serve. If serving sauce immediately, while sauce is cooking prepare your pasta of choice. When pasta is ready serve with pasta sauce. If you make this recipe or a version of it, take a picture and share with me on Instagram, tag it #thewholeserving or leave a comment below. I’d love to see or hear about your version of this Fire Roasted 20-Minute Pasta Sauce. 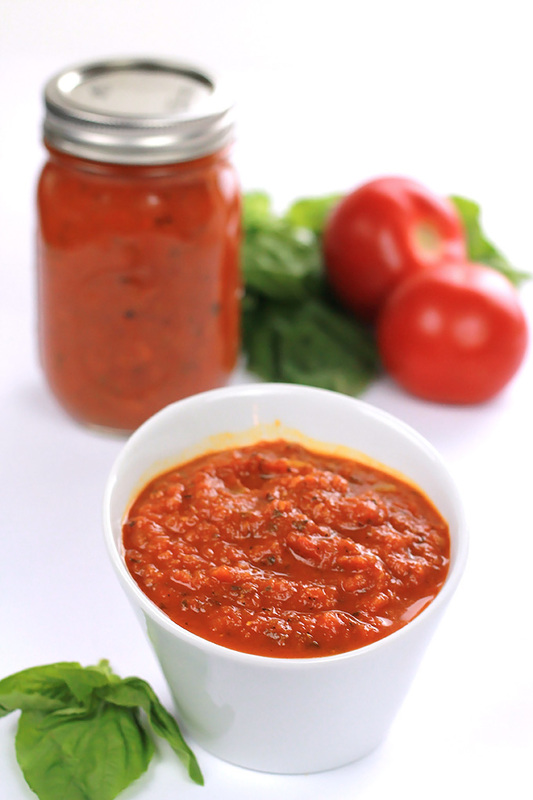 You can’t go wrong with homemade pasta sauce! I love that you used fire roasted tomatoes too. So good! Yeah, I love the little spice that the fire roasted tomatoes add. 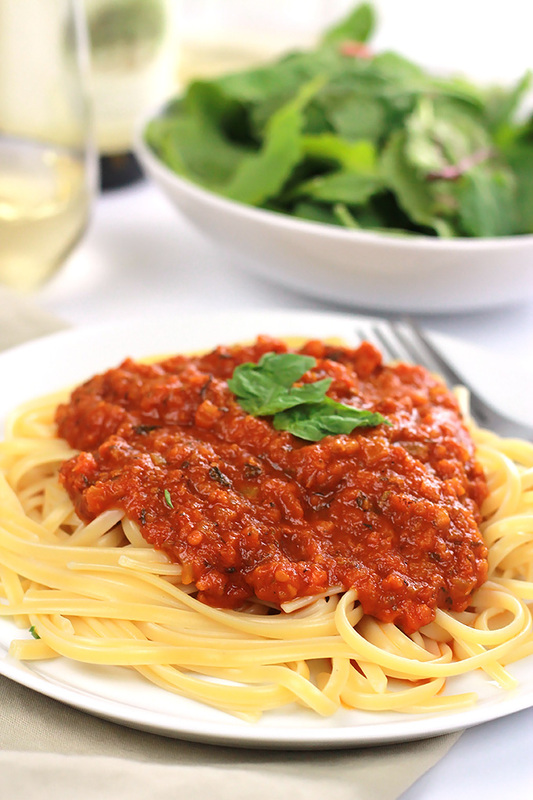 Homemade is the best and this pasta sauce looks so yummy and full of flavor. Full of flavor and more control over the ingredients. Thank you so much for posting this! I have been dying to learn how to make my own pasta sauce! This looks so delicious and I can’t wait to try it! Thanks Christina, I’m glad you like it. Please let me know how it works for you. This looks really good! I also like the extra helping of veggies. Thanks for sharing at the Over the Moon Party. This looks delicious! I have never been able to find fire roasted tomatoes where I live though- so do you have another alternative for this? Hi Christina, If you can’t find fire roasted tomatoes and you still want the heat that they give, you can just add red pepper flakes to your sauce. Yum! I love the idea of using fire roasted tomatoes to add a different flavor to traditional pasta sauce! Thanks for linking up with Merry Monday this week. I think it gives it a bit of a kick, but not too hot.I’m glad you like it. I make my own marinara sauce too and I love that when I make homemade pasta sauce, I can incorporate vegetables in it for my kiddos. Thank you for sharing this over at #healthyliving link party and hope to see you again! Yum! This is my kind of pasta sauce! I can find a zillion uses for it. I am delighted that you shared your healthy, delectable, robust, rich and flavorful Fire Roasted 20-Minute Pasta Sauce at the Healthy Happy Green Natural Party! I’m Pinning and sharing this! I like putting the carrots in for an extra bit of veggies. It was the best way to hide them from my daughter when she was younger.